Wacom is an old name when it comes to digitizer tablets as well as styluses that simply work, and work well. This time around, the Wacom Clipboard has been revealed to transform your business into a more paperless environment. Granted, one can never end up with a truly paperless environment, but there is the possibility of minimizing whatever use of paper wherever possible. With the Wacom Clipboard, such a vision becomes easier, since businesses are able to transform paper documents into the digital format — in real-time. Also known as the PHU-111, the Wacom Clipboard is a smartpad which will allow users to complete and sign documents with the help of standard paper forms as well as ink. It will then convert the documents to a digital version in real-time. Biometric handwritten signatures will also be able to be captured and attached. The digital documents can subsequently be stored on local PCs, or simply have them uploaded immediately to servers or the cloud for easy document management. 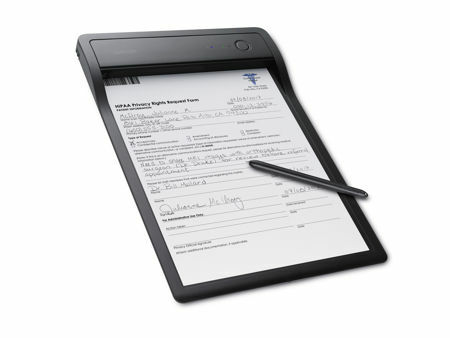 Businesses such as service, healthcare, insurance industries and public sectors that still require paper forms but would like to move to a digital archive can always rely on the Wacom Clipboard to deliver a secure and easy method of instantaneously digitizing and saving these paper documents, all without having to change existing paper-based workflows. The electronic clipboard will be paired to a host PC or a mobile device through Bluetooth, although there is also an option for USB connectivity when making use of a PC. Anytime a document is placed onto the Wacom Clipboard, the integrated barcode reader will be able to automatically identify the document, communicating with the PC or mobile device in order for the corresponding digital document to be called up. While there is no word on pricing just yet, the Wacom Clipboard is tipped to be ready for shipping at the end of July 2017.